Cascades is a spacious villa that can easily accommodate up to 12 people in its 6 bedrooms. The home is open and airy, making guests feel completely comfortable whether they’re inside or outdoors lounging on the terrace by the pool. Children are welcome at Cascades, so this is the ideal choice for a family vacationing on St. Martin. It is also conveniently located just minutes away from the nearest restaurants and grocery stores, and the beach is just a two minute walk from the villa. Whether you spend your days lounging poolside and taking in the view or snorkeling at nearby Plum Bay beach, you’ll feel right at home at Cascades. Two minute walk to Plum Bay beach! 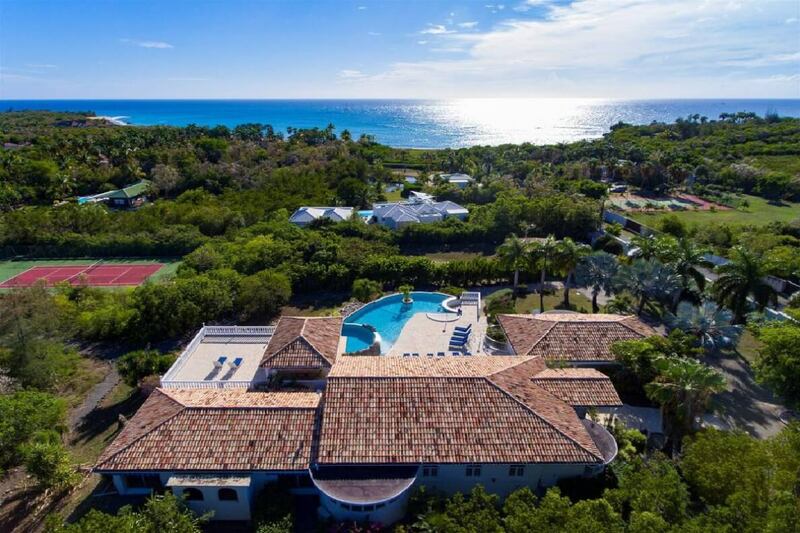 Overlooking Plum Bay, this 6-bedroom, 6.5 -bathroom villa has a cascading pool and extensive two-level terrace providing lots of space for lounging and outdoor living. The airy interior spaces include a large living room with a TV viewing corner and a dining area extending directly out to the terrace for great sunset views over the Caribbean. There is a fully equipped modern kitchen and a gas grill for barbecuing on the terrace. The 6 spacious bedrooms each have an en suite bathroom and air-conditioning. For the sports-minded, the villa has a large exercise room on the lower floor with gym and games facilities, and for outdoor sports, there is also a tennis court. The villa is just a few steps from the unspoiled beach on Plum Bay. Just a few steps from Plum Bay beach; approximately a 2 minute walk. Welcome, however best for older children as all bedrooms have outside access. The free rental car covers the base rate of a Hyundai i10 or equivalent. Gas, insurance, and upgrades not included. Good for travel before Dec 15, 2019. Good for stays from Apr 23, 2019 to Dec 14, 2019.